Rock Whores of 64 Page 5 has now been released! The media targets the Anti-Suicide band calling them “Softie” and are being compared to the Incinerators. Mark Monday doesn’t want to get involve with all the commotion and just tried to calm his group that they are unique in their own way. Not even Incinerator can incinerate them. She Incinerator at Rock Whores of 64 Page 4! 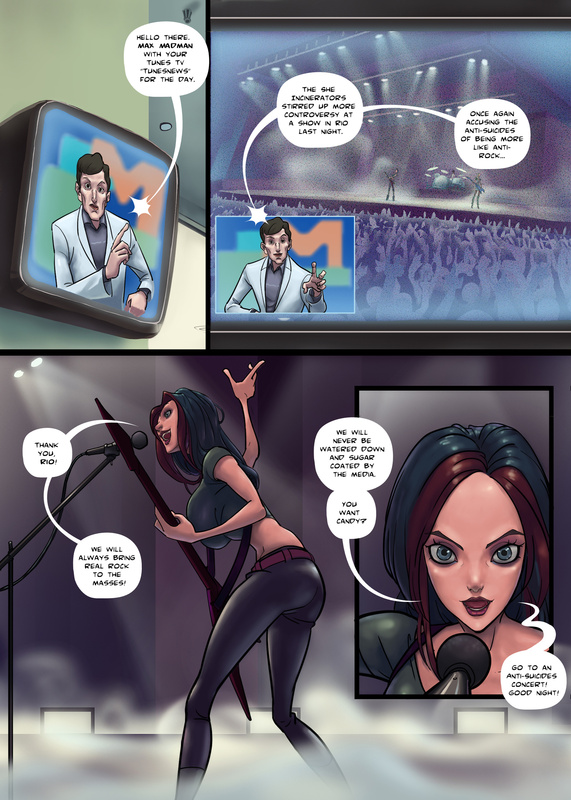 Rock Whores Page 4 has now been released! Cindy Incinerator is ready to rock of your world! After being hit back by mass media against the Anti-Suicide band. This doesn’t stop Cindy nor the other band members get suffocated by anyone. Cindy who refers as the hard rock princess still has her soft side of her especially to Mark Monday from Anti-Suicide.